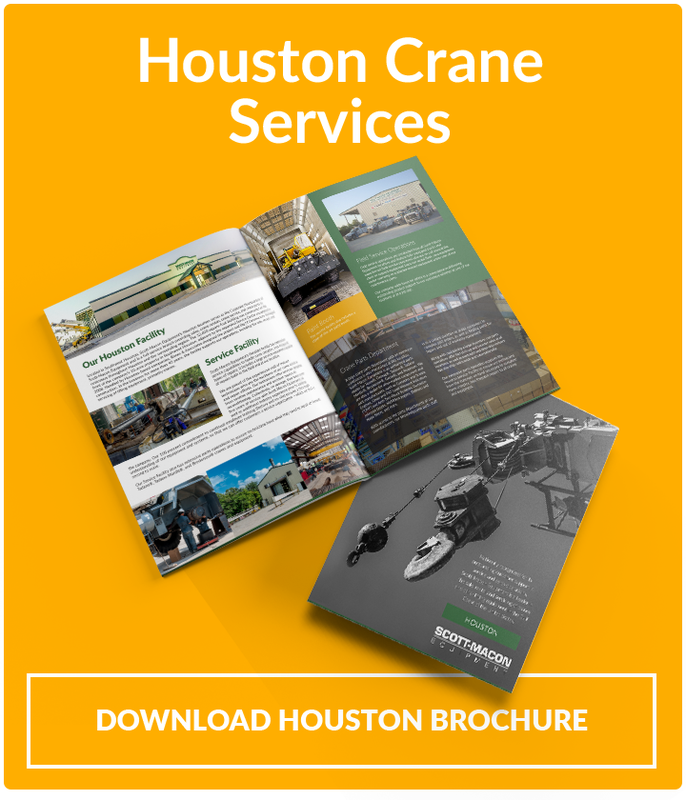 Providing Houston crane sales, rentals and service. Located in Southwest Houston, Scott-Macon Equipment’s Houston location serves as the Corporate Headquarters of Scott-Macon Equipment and is a full-service branch providing sales, crane rentals, crane service and crane parts to customers throughout Houston and the surrounding region. Scott-Macon Equipment’s Houston branch is an authorized dealer of Demag® All-Terrain and Crawler Cranes, Terex® American Crawler Cranes, Terex® Rough Terrain Cranes, Truck Cranes and Boom Trucks, as well as Genie® material handlers and man-lifts. In addition, Scott-Macon Equipment’s Houston branch is an authorized dealer of Tadano Mantis® Hydraulic Crawler Cranes. The Houston branch is also an authorized dealer of Broderson® industrial carry deck and rough terrain cranes. Scott-Macon Equipment offers a wide range of cranes in order to better meet the varied lifting need. Our crane rental Houston fleet consists of a wide range of cranes to meet the varied lifting needs of customers including Broderson® industrial carry-deck cranes, Terex® Rough Terrain Cranes, Tadano Mantis® hydraulic crawler cranes, and Terex® boom trucks and various other brand rough terrains as well as Genie® material handlers and man-lifts. Scott-Macon Equipment’s Houston facility includes a large service operation capable of repairs both in the field and at our location. The service facility also includes a state-of-the-art paint booth. A large Houston crane parts department with an extensive warehouse is also maintained at this location. Serving as the corporate headquarters, the Scott Macon Equipment Houston office acts as a full-service branch providing crane sales, crane rentals, and crane service to customers throughout the Houston area.